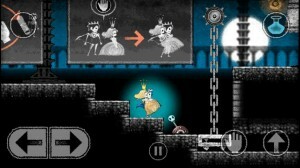 Dokuro is a beautiful game, with gorgeous charcoal graphics, that has just been released for Android and iOS devices. It comes from the PlayStation Network, where it is one of the best games available to download for the PS Vita last year. 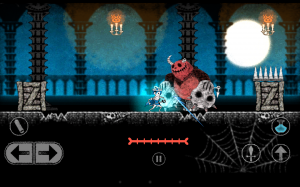 You play as a skeleton who felt in love with a beautiful damsel trapped in the castle of your giant demon’s lord. You immediately tries to free her, but for some unknown reason she cannot see you and run away. Your mission then is keeping her safe, something that quickly becomes a tricky task. The both of you can be crushed by a falling block, stabbed by floating demons or sharp spikes, burned by flame-throwers or sliced by circular saws. The combats are very basic and the platform is also straightforward in terms of controls, although you need to use quite fine abilities in some places. It doesn’t seem to have the option for external controllers or SHIELD compatibility, but the controls are really easy to master. Dokuro also includes a kind of physics engine, which adds some sense of weight to the movement of the characters and have some effect on seesaws. On the upper part of the screen there are several gameplay elements designed to help you to think about the best way to handle the situation you are facing. For instance, the different colors of chalk have different properties, like connecting objects (white color), create burning fuses (red color) or filling areas with water (blue color). However, the amazing charcoal graphics are one of its best features. The main character shows a particular “Why me?” attitude, only changed during the quieter moments with the princess. The game has been developed by Gung Ho, makers of titles like Princess Punt and Silpheed Alternative AM. Dokuro is not as sophisticated as other games in the genre, but it’s a really good tight puzzle platform to buy for just $0.99. You can purchase it on the Play Store and iTunes respectively.